Hung Gar Kung Fu is a style that was developed at the Sil Lum (Shaolin) Temple, made famous by a man named Hung Hei Guen. His real surname was Jyu, and he made his living as a traveling tea merchant. One day while traveling, he was confronted by nobles of the Ching dynasty, who started a fight with him. After this incident, Jyu was a wanted man with a price on his head, so he fled to the Sil Lum temple, which was known for producing amazing Kung Fu fighters through extremely hard training. When Jyu arrived he was taught under the head monk, named Gee Sin Sim See. Gee Sin’s took student Jyu as one of his special disciples. working with him for many years. He worked closely with Hung and helped him to develop the Tiger system. 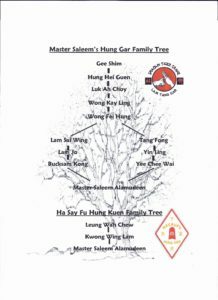 It is said by some Hung Gar practitioners that Gee Sin Sim See was the creator of the Hung style, but this can be argued. Gee Sin Sim See is also noted for helping spread the art of Hung Gar throughout southern China. Jyu studied at the temple until it was attacked by the oppressive Ching government. The Ching, or Manchu, government’s attack on the temple was fierce. They wanted Kung Fu suppressed because it gave people power and could unify them to overthrow the Ching. The Ching army marched on the temple and burned it to the ground. 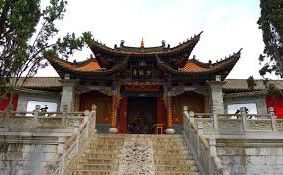 They succeeded in destroying the temple, and killing most of its residents, including Gee Sin, but Kung Fu survived. Jyu fled the temple, escaping with his life. He then changed his name to Hung Hei Guen, and his life’s purpose was to crush the Chings, and restore the Ming dynasty. Hung Hei Guen further refined his style after his marriage to Fong Wing Chun by amalgamating, or joining, the two animals Fu & Hok (Tiger and Crane) styles together as one. The Hung Gar system has five animals: Dragon (Loong), Snake (Sare), Tiger (Fu), Leopard (Pao) and the Crane (Hok). This system relates to Yin and Yang, a balance duality, in that it contains hard pounding techniques, and soft elusive movements. It also contains the five elements: Gold (Gum), Wood (Muk), Water (Soy), Fire (Faw) and Earth (Tow). Although the main focus is on the Tiger and the Crane, these other techniques are there to make Hung Gar a more balanced style. It became a style that focused on personal physical, mental, and spiritual development. It is said that Hung Gar Kung Fu was “born of rebellion, created in secrecy and having arisen from the ashes of the Tsu”. While philosophically accurate, our knowledge of the real history of Hung Gar is even more mysterious. What we do know about the history of Hung Gar is very little in comparison to the real events that must have taken place for this remarkable system of martial arts to still exist with us today.